The FinTech sector – combining the spheres of finance and technology – is one of the fastest growing industries in Singapore. With a high concentration of financial institutions across banking, insurance, and asset management sectors, the city-state offers an exceptional platform for FinTech solutions. Singapore has a gross domestic product (GDP) per capita of US$52,960, world-class infrastructure and excellent internet accessibility. The country boasts of ultra-high-speed fiber infrastructure that runs across the nation, and mobile subscription penetration that exceeds 100 percent – factors that are key for FinTech growth. What makes the country more conducive to FinTech growth is its strong policies, effective tax incentives and a number of policy initiatives that support FinTech. Besides, a good talent pool with financial expertise and availability of capital for early-stage investment make Singapore the best market for up and coming FinTech startups. 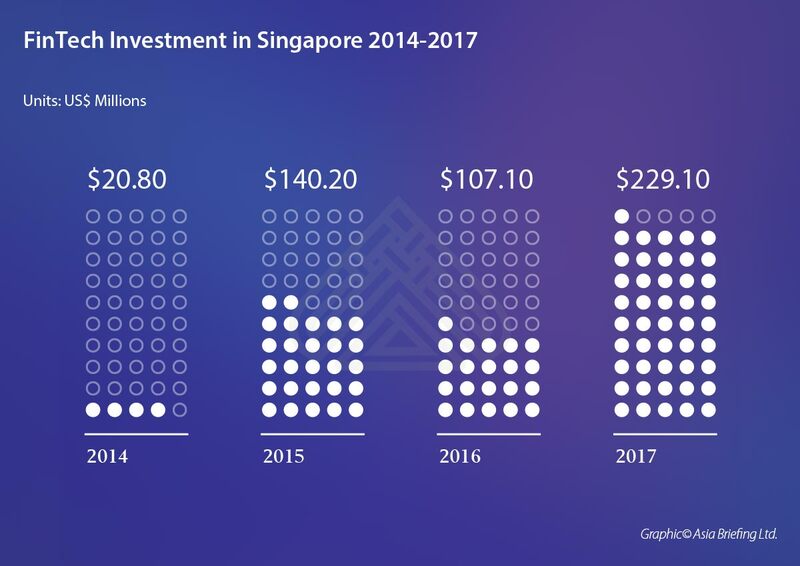 In 2017, the FinTech sector in Singapore saw the largest amount of funding across a single year, with US$229.10 million worth of investment, despite a decline in overall FinTech funding across Asia. The funding landscape in the country comes largely from angel, venture capital (VC), corporate venture divisions, and government entities. Some of the key investors in the Singapore startup landscape include 500 Startups, Golden Gate Ventures, Sequoia Capital, Singtel Innov8, and government entities such as GIC and Temasek. In the latest funding round, the two of the ten major deals were mobile commerce start-up GoSwiff’s US$100 million purchase by Paynear Solutions, and global asset management FinTech player Smartkarma’s US$13.5 million series B round. 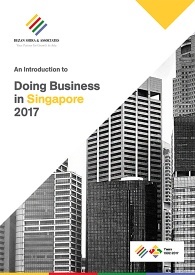 In Singapore, most entrepreneurial activity and funding is centered on payments and remittances, crowdfunding, WealthTech, marketplace lending and insurtech. 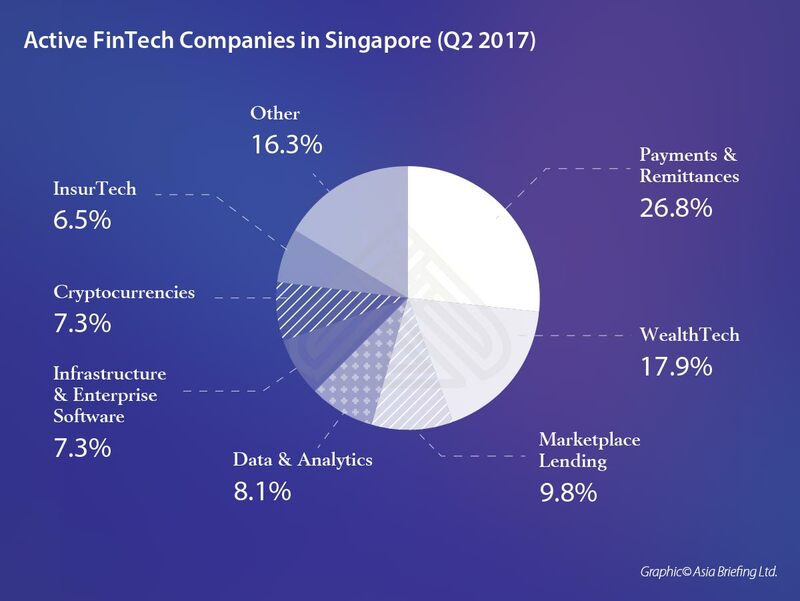 In the second quarter of 2017, payments and remittances companies occupied 26.8 percent share in Singapore’s FinTech sector – equivalent to 33 active companies, followed by WealthTech occupying a market share of 17.9 percent. Some of the major online payment service providers in Singapore include MC Payment, PaySec, Yololite, GoSwiff, SmartPesa, and BillPay, among others. Mesitis, Smartkarma, Traderwave, Bambu, Stashaway, and GoInvest are some of the leading WealthTech companies. 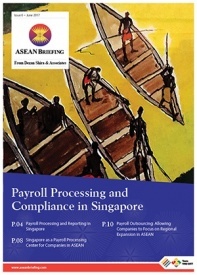 There are no specific regulations for FinTech business as such in Singapore; however, FinTech business carrying out particular financial services may fall within the ambit of one or more of the existing regulatory regimes governing those financial services. These are – the Banking Act, the Securities and Futures Act, the Insurance Act, the Business Trusts Act, and the Finance Companies Act, among others. The Monetary Authority of Singapore (MAS) is the chief regulatory authority that supervises FinTech businesses in the country. With regards to data protection, Singapore’s Personal Data Protection Act 2012 comprises rules for the protection of personal data and applies alongside other Singapore laws and regulations. Singapore also has a cybersecurity law – the computer misuse and cybersecurity Act that criminalizes the commission of offenses involving computers and regulates cybersecurity infrastructure in Singapore. Going forward, the country has announced a new cybersecurity act to strengthen the cyber environment and combat the evolving and growing threat of cybercrime. In the intellectual property area, Singapore’s IP regime has consistently been ranked as one of the best in the world. 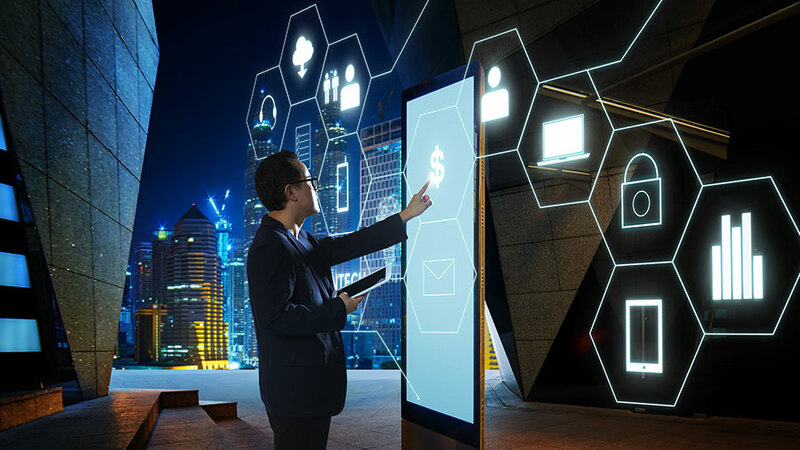 Recently the government launched a new FinTech Fast Track initiative to expedite the patent application-to-grant process for financial technology innovations and help businesses bring their FinTech innovations to the market more rapidly. Under this initiative, investors can avail FinTech associated patents in as early as six months, as opposed to the minimum two years for normal applications. The MAS has played a pivoting role in establishing Singapore as a strong economic competitor in the global FinTech industry. In 2017, the central bank rolled out a slew of initiatives to boost the domestic FinTech sector and connect startups with investors and potential partners. Some of these include the creation of a new FinTech innovation hub named 80RR, a partnership with the Association of Banks in Singapore on cybersecurity, and the development of a cross-border platform for trade finance using blockchain technology. Development of sandboxes – Herein financial institutions can test the viability of their financial technology products and services in a cost-effective controlled environment and within a well-defined space and duration. Looking glass at MAS – it is a platform for the FinTech community to connect, collaborate, and co-create with one another. Besides, the MAS has committed USD 225 million to the development of FinTech projects and signed several cooperation agreements with governments and institutes of various countries to facilitate information on FinTech trends and issues. Some of these include institutions in the United Kingdom, the United States, Latin America, South Korea, Australia, Thailand, Hong Kong, and institutions such as the Massachusetts Institute of Technology (MIT). There are many other accelerator programs in Singapore that seek to boost FinTech startups, often providing entrepreneurship workshops, business networks, and all-rounded mentorship. Located in the heart of Asia, Singapore offers FinTech startups possibilities for exponential growth in the ASEAN region. The country acts as a gateway for FinTech companies to explore ASEAN’s emerging economies that have much less mature financial markets and are on the verge of a digital revolution. Through Singapore, a FinTech company can access a single market size of over 625 million people in the region –which is greater than the European Union (504 million) and the United States of America (319 million).